Life at the family internment camp in Crystal City, Texas was an odd mix of confinement and normalcy. On one hand, internees were encompassed by barbed wire fences that they could not cross under penalty of death, but teenagers attended a high school where they attended football practice and elected a "campus queen" each year. This strange dichotomy is apparent in the film and photos captured at the family internment camp. 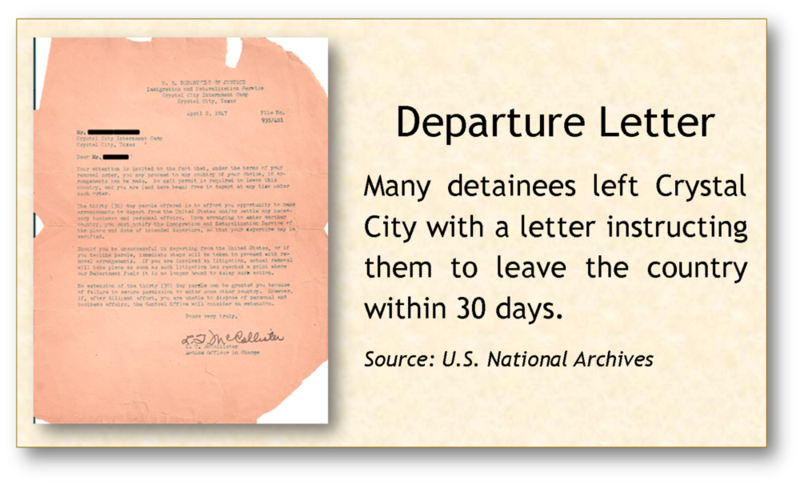 Explore this page to get a glimpse of life at the Crystal City internment camp. The film below titled Enemy Alien Detention Facility, Crystal City, Texas was captured by U.S. Army personnel on 16mm cameras and edited with narration by the U.S. Department of Justice Immigration and Naturalization Service in 1945. The film includes scenes of daily life at the camp. Creation of the film is described in Chapter 16 of The Train to Crystal City by Jan Jarboe Russell. Film Source: U.S. National Archives (Identifier 13206) - downloaded from www.archive.org. Emily Brosveen, "World War II Internment Camps," Handbook of Texas Online, https://tshaonline.org/handbook/online/articles/quwby (last visited Sept. 28, 2016).